Home » Blog » Amazon Deal Blog » Introducing the Frugal Living Community at BlogFrog! Introducing the Frugal Living Community at BlogFrog! We are excited to announce that the peeps at BlogFrog have invited us to be one of 9 bloggers who are Community Leaders in their newest breakout community, FRUGAL LIVING COMMUNITY! What is the Frugal Living Community over at BlogFrog? First of all, a little about Blog Frog (this place it HOT!). BlogFrog powers thousands of online niche communities for women and moms, and is the largest network of mom blogs in the U.S. (WOW!!). BlogFrog combines the power of networked blogs and the technology of powering niche communities to enable relationship and trust-building between brands and women online. BlogFrog now has over 45,000 mom blog members and reaches 3 million moms each month. The Frugal Living Community is Sponsored by Ebates… we’ve told you how much we LOVE shopping through Ebates. If you shop online, you are losing money if you DON”T use Ebates! You can learn all about Ebates here and here. Ebates is the pioneer and leader of online Cash Back Shopping, working with over 1200 online retailers, and paying it’s members over $50,000,000 to date. Ebates works by commission; for each shopper Ebates sends to a store, that store will give Ebates a commission, which Ebates then shares with it’s members. …attracted over 1300 members and 50,000 page views! We feel honored to be a part of this super fab community! You’ll see us in the community interacting with it’s members and 8 other savvy bloggers (check us all out over there on the right!). We feel pretty special to be rubbing shoulders with these fine women! We invite you to join us! There are so many great discussions going on over there! Got a question about couponing or frugal livng? Ask! If you haven’t signed up for BlogFrog yet, Monica shows you how in this video. 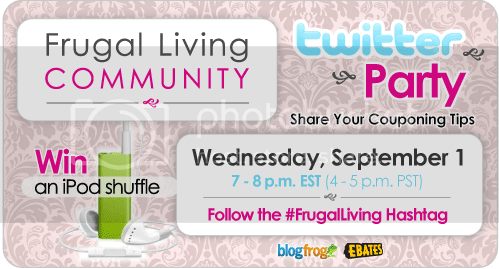 Stay tuned… on Wednesday September 1st at 5:00 MST, the Frugal Living Community will be hosting a TWITTER PARTY! Come and participate, because they’ll be giving away a slew of prizes! I’ll give you more details on Wednesday (along with Twitter tips if you’ve never tweeted in your life! ).